My husband Thom grew up in a very religious household. A questioner by nature, he struggled to grasp what he was told without constantly asking for evidence. But one thing he heard stood out as absolutely true. Without a doubt, he knew deep in his heart and soul that the most prized possession on Earth, more precious than gold or jewels, had to be wisdom. The certainty of that awareness never wavered. As it turns out, new research appears to confirm that obtaining wisdom just might be central to what leads to a happy and healthy long life—in other words, a key to positive aging. And it’s likely that treasure is something all of us would like to experience in the years to come. Whenever I am offered a new book to review I accept it with openminded skepticism. But when a new book combines both brain science and positive aging, how could I not be interested? Timeless—Nature’s Formula For Health And Longevity by Louis Cozolino does just that. Even better, it taught me how and why the pursuit of wisdom plays a major role in creating a life of health and well-being as we age. Cozolino proposes, “What if, just like during adolescence, the brain goes through a series of modifications that prepare us for the challenges and responsibilities of each stage of life?” And in fact, what if those changes and adaptations are what set us up perfectly for becoming wise elders with a vital contribution to our communities, our world, and future generations? One of Cozolino’s more interesting ideas is that our brains are not solitary mechanical objects in our individual bodies. He proposes that our brains are actually social organs deeply interconnected through our history, our relationships, and our environment. We did not become who we are today (regardless of our age) by ourselves alone but have instead evolved and adapted along with our environment and communities. 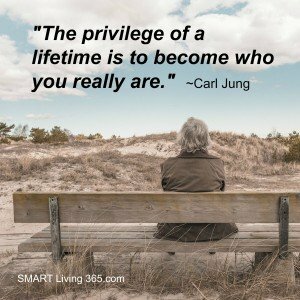 If that is true, then as we age within this social interconnected context, we have “a number of advantages when it comes to being wise.” Our “slower pace, broader perspective and years of experience” allow us to bring much more to any situation. We are also, “better equipped to integrate emotion, intellect, and intuition.” While our culture’s obsession with youth usually makes it seem that the young have all the advantages, this ignores the enormous contributions that elders have to offer the whole. Young brain: Can easily remember numbers, names, and facts. Vs Older Brain: Improved emotional and relational abilities. Young brain: Better explicit memory. Older Brain: Better implicit memory. Young brain: jumps to fast and singular conclusions. Older brain: understands that things are usually more complex than what meets the eye and is more comfortable with ambiguity and uncertainty. Young brain: quick reflexes. Older brain: poised for reflection, contemplation, and integration. Young brain: looks for danger and what’s wrong. Older brain: recognizes the positive and finds it easier to forget the bad. Young brain: greater executive function and attention. Older brain: higher emotional stability, enhanced social judgment and empathy, and sustained attachment. So, is wisdom guaranteed as we grow older? Unfortunately, no. Just read the newspaper or watch television. As Cozolino writes, “Greater age seems to be associated with wisdom only for those with higher levels of emotional development, moral reasoning and investment in other people.” The good news is that when we reach for wisdom our bodies and our brains benefit. He continues with, “…since wisdom reflects an integration of brain functioning, it should also correlate with better physical and mental health, mature psychological defenses, and life satisfaction.” In other words, seeking wisdom is good for our body, our mind, and our happiness. Just remember, such wisdom demands an agile brain that embraces flexibility, adaptation and constant challenge. It also requires an awareness of our connections and the ongoing need to communicate to thrive and survive. In fact, in terms of our brain, the worst thing we can tell ourselves is that we’ve earned the right to zone out, just focus on ourselves, and do whatever we want just to be safe and comfortable. There is plenty more in this book about things we can do to enhance our longevity, but in my opinion, the messages that promote the idea that our brains have evolved to suit our longevity in community through wisdom is a powerful one. 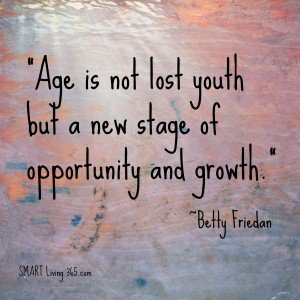 This message is important for those of us growing older as well as younger generations who will benefit from the wisdom that we embody. And let’s not forget that in certain circles, wisdom is considered more valuable than all the gold or jewels in the world. I don’t know if I’ll ever be considered wise, but I believe it would be a SMART intention for all of us as we face the days to come. Okay, your turn. 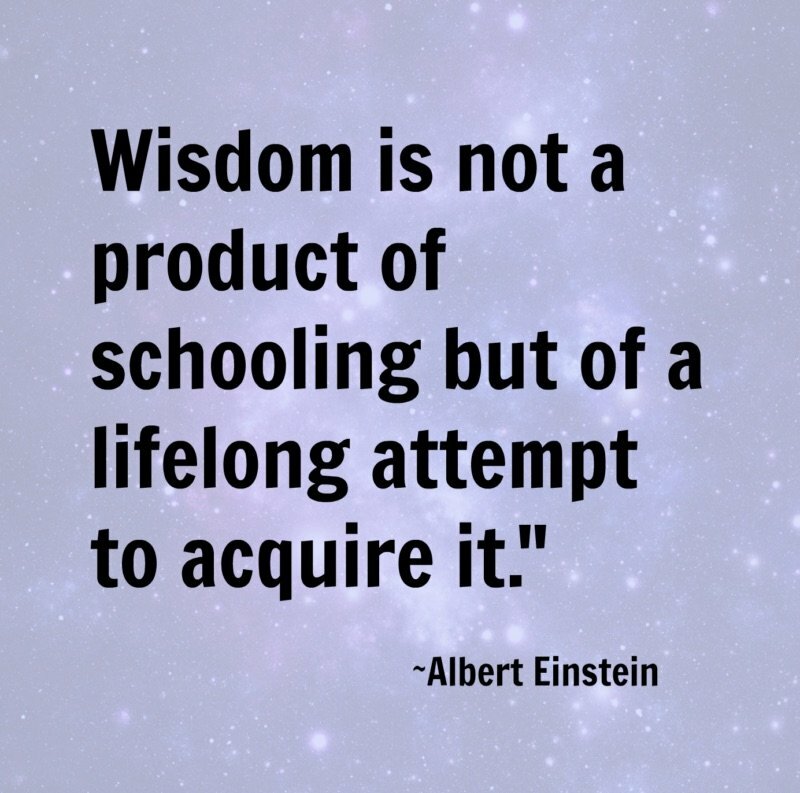 Is acquiring wisdom something you see as valuable? Why? And who are your role models? Please share in the comments below. This is so interesting and makes perfect sense that our brains adjust, grow, ebb and flow as we age. I have never read more in the last few months as I soaked in so much information with which to create my class content and curriculum! Reading “new” management ideas coupled with my 35 years of experience I believe brought this new (to me) class into the 21st century (some old outdated ideas were still being taught). I also think that emotional intelligence plays a big role in this as well, as you mentioned. Funny that I don’t feel like a wise elder (LOL), but to my students I guess I am. Cozolino is doing some very interesting work in neuropsychology. I think that researchers have known for a long time that human cognition, emotional processes, and social intelligence develop over time and become more sophisticated and integrated as we develop/age. (However, this research has not always been well represented in popular media). Although there have been great strides made in recent years in research on brain function, there is still a huge gulf between what we know about the physiology of the brain, and our psychological models for socio-cognitive functioning. Because we still know very little about how cognitive development maps onto brain processes, I think it is important to make a distinction between the brain as a physical organ, and aspects of human cognitive functioning such as decision-making, wisdom, and learning. 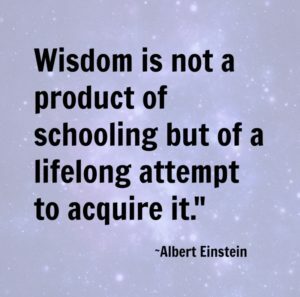 That said, I agree with you (and Cozolino) that striving for wisdom is a worthy goal, and that if we seek wisdom throughout life as we interact with others, we are more likely to live longer, better lives. This is so because the development of our mental processes (thinking, social responses) is both cognitively (Piaget) and socially (Vygotsky) constructed though our experiences. What this means is that we actually shape our own capacity for thinking by the kinds of intellectual tasks we engage in, and through our interpersonal interactions. I never thought that younger people would be smarter or have more “wisdom”. To the contrary… I have always had respect for older generations, realizing what they must have gone through in their life and how they collected experiences and wisdom younger generations could learn for. I always saw older people as wiser people. And, I like that quote of the American Indian elder. Yes, wisdom is important, and one can/should improve on that every day, young or old. Why is wisdom important? Because it stimulates curiosity and not only improves our knowledge intellectually and offers the means for engaging discussions, but it teaches us skills that might come in handy. Kathy, I too love the old vs young brain comparisons. This book has been put on my to-read list as I am also a lover of brain science. I want to better understand the nuance differences between knowledge and wisdom. Thanks for great summary. 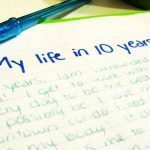 Hi, Kathy – This is a very timely post for me. I was just reading some trending research that has stated, as a general rule, older people have better solutions to conflict. They tend to argue less and anger less easily than younger people. I am very interested in reading more! Hi Kathy what a great book and message and definitely aligns with how I view the aging process. Today I’m MC and Guest Speaker at an event and I will be discussing ways to have an Ageless Attitude. I’m also participating in the Mindful in May Challenge and an interview earlier this week discussed how we can keep our brains more alert, and even perhaps turn back time if we exercise them through using our brain but also by being mindful as well as showing generosity and kindness which I thought was a wonderful combination. Thank you for the review of the book which I will be keen to read. Enjoy your weekend. I loved the young vs old brains you listed! SO true. Starting new hobbies or learning new things is always important for your mind as is being open to new ideas contrary to yours. Just because someone doesn’t think the way you do does not mean their views are not valid. 4 years ago I took an intensive course that pretty much occupied my mind and time for 4 months having to study 6 days a week. Other people finish the course in 2 years. I did it because I was interested and wanted the intellectual challenge. Some folks thought I was crazy since it could lead to a job but the monetary benefit was not my goal but the understanding and knowledge was what got me. I think of course it expanded my brain! I really enjoyed the Young Brains vs Old Brains comparisons. At my age (66) I find that I am (happily) less attached to who listens to me or whether or not they agree with my ideas of how things “should” be done. I can’t tell you how much I love this quote: As we inevitably wrinkle and lose some of our energy, people with identities based on beauty and physical prowess are faced with having to discover new ways of valuing themselves. At a certain point in life, you have to jump off of your body and onto your spirit for the last act of life’s journey.” The Young Brain vs. Old Brain comparisons were so interesting and rang very true. Being smart vs. Being wise… Wisdom is the thoughtful, caring, positive application and use of the smartness you have obtained. 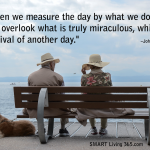 Yes, this is certainly one aspect of positive aging and happiness. Experience and perspective define wisdom for me. And those terms, obviously, are an outcome of age, although some young people appear to come into this world with a miraculous store of wisdom! I like Cozolino’s analysis of how ‘young brain’ and ‘old brain’ think, and how the perspectives differ. Very creative, and a useful resource! Wow! Good book! Great piece Kathy! I just wrote a piece for Boomer Cafe along the same lines! I ask: Do Boomers have a responsibility to pass on knowledge and wisdom, and will anyone listen?